When you see a sight like this, you know what can be done. 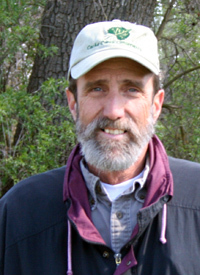 Ben Adamo is now a Conservancy board member, but he remembers his past relationship with Cache Creek and the site where the Nature Preserve now lies. Mr. Adamo’s first encounter with the Nature Preserve site was long before it was a preserve, perhaps before the area even needed preserving. He began his relationship with the site as a welder for the first company to mine the site. This company later offered him a position as a gravel miner. He quickly rose to the level of foreman, overseeing the company’s operations on the site. Ben Adamo now helps to oversee the site in a different capacity, as a member of the Conservancy board. He has watched the site evolve from a place that he mined in his youth to a place he now protects. Could you briefly describe the evolution of this site? When I first came here all the wetland area was covered in gravel which wasn’t natural because this was originally farm ground. The gravel had been brought up out of the creek to create a yard for a gravel plant. I was hired on here to help construct the gravel plant, then to process the material out of the creek. After we left in ’86 we exhausted the supply of the material in this part of the creek. Teichert bought the property as well as the adjacent facility, the Stallion Station, which is what we hear in the background. They mined the site and basically made this depression, which became the wetland after the Conservancy took it over. Well, as a person in the [gravel] industry I think it’s important from the standpoint of being able to show the public what can be done with reclamation, after a site is mined. Obviously when I was here initially, we were producing sand and gravel. There were stockpiles here and an operating gravel plant, and subsequently the site itself was mined for the aggregate. Then it was reclaimed to what we are seeing today. It is a beautiful natural setting—somewhat natural—and it is also a site that is used for educational purposes. A lot of students come out here and use this site and that is pretty exciting to see! How do you determine a baseline for restoring a site? A lot of that is somewhat pre-determined by the site. I used to have an employee who worked for me here who had a saying, “You can’t make a silk purse out of a sow’s ear,” and that is true of any site. You have to look at the site and determine whether it was a dry landscape to begin with and is that what we are going to end up with when we’re done. Everything has changed. When you look at this area pre-mining, pre-agriculture… some of these areas have been leveled out for agriculture and that changes how the water flows. It used to be when it rained here, or there was a big event, the water would be trapped in the little valleys that were formed by the hills. So the water wouldn’t all run off right away. In the ’60s, they leveled a lot of ground to get more efficient in the farming operations. After they did that, once it gets saturated, everything else runs off. I was talking with Jack Combs [former renter of the Nature Preserve site], who said he never used to see that kind of water in the slough, because all the upstream land used to be hilly ground. After they did the major leveling everything is graded so they could farm it and irrigate it. That forces a lot more water into the slough. He said, “I never used to see this much water when I was a kid.” He had lived here for his entire life. "If you are going to restore to pre-pioneer days, it might not be realistic. It’s mostly based on where the water table is, especially with the agriculture constantly pumping. That’s all for a purpose, for food, it’s a different environment. The places that used to have a natural water supply wouldn’t have that now if you tried to restore it. So do you artificially irrigate it forever, when you’re trying to create a natural habitat? Generally, you try and create a place that, once established, will take care of itself from there on out. Like I say, it’s challenging, but it’s fun!" What impact does the Preserve have on you, what things do you take from this? One of the things that happened, right around the time that I came to work here was that California passed the Surface Mining and Reclamation Act, SMARA. Years ago, you didn’t have to have a plan when you started a [mining] project, but after 1975, any project needed to have a plan and financial bonds in place to cover restoration or a final reclamation plan. One of the things that I have been involved in for years is to look at a site and decide how we can restore the property. Every site is a little different, and it helps that I started in the operational side and moved into the management side. This site has a lot of water and soil available. For sites upstream from here, with a lower water table, you can’t get this type of vegetation so you have to plan accordingly. Those sites whose water table is 45 feet down have completely different plants, so I have been working with biologists to determine the type of vegetation that will be best for a site or if it’s going to go back to agricultural land when you’re done. Finally, you need to get approval from the lead agency, which in this case is Yolo County. This is a challenging project, but can be very rewarding. Especially when you see a site like [the Nature Preserve], you know what can be done.